Republican California gubernatorial candidate John Cox stopped in Fresno for his #HelpIsOnTheWay statewide tour Thursday afternoon. To a small crowd of media only, Cox discussed issues facing the high-speed rail project while near an active construction site for an overpass. “It really is the train to nowhere, isn’t it?” Cox said as he stepped off this tour bus and looked at an unfinished rail along Highway 99. “The train to nowhere represents the biggest point of departure between me and my opponent in this race,” said Cox. There are 1 million residents in the Fresno metropolitan area. Pretty sure they don’t consider their city as “nowhere”. Scientists have learned about the earth’s atmosphere and concluded that human activity and carbon emissions are responsible for climate change. Seas are rising, oceans are warming, the atmosphere is warming, the land is warming, ice is melting, heat emergencies and wildfires and hurricanes are increasing, rainfall patterns are changing, and the ocean is becoming more acidic. The risks and consequences for humanity cannot be overstated. All cities — even small ones — have a responsibility to address the most significant challenges of our time: climate change, income inequality, and housing affordability. I believe that adding multifamily housing at the BART station is the best way for Lafayette to do its part, and it has therefore become increasingly difficult for me to support, advocate for, or implement policies that would thwart transit density. My conscience won’t allow it. Lafayette residents deserve a city manager who is better aligned with their priorities. 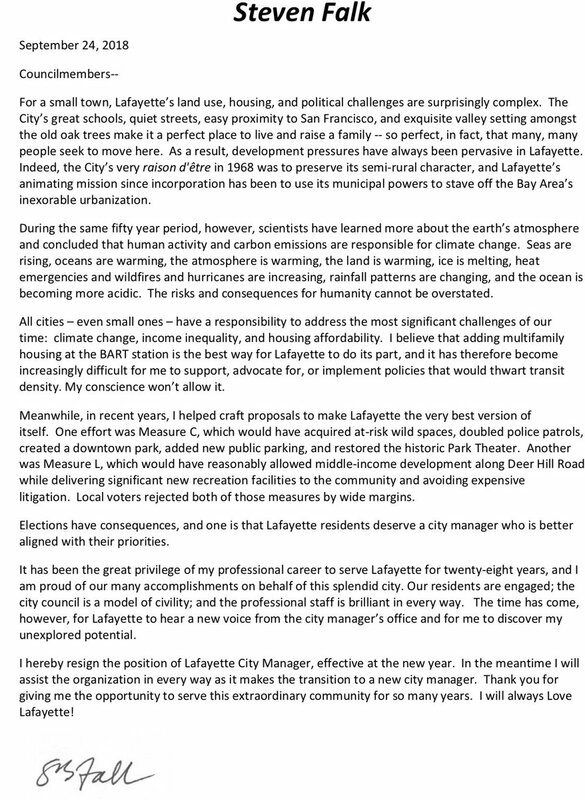 I hereby resign the position of Lafayette City Manager, effective at the new year. The Governor has yet to issue a decision on the BART housing bill (AB-2923). If the bill were to become law, then BART should definitely hire this guy to do the Lafayette TOD planning. As you can see, her feet come nowhere near reaching the floor. And that’s despite sitting at on front edge of the seat. It is hardly the first time I’ve seen something like this. Every time I see someone shorter than 5’2 try to sit in one of these seats, they look like a toddler in a high-chair. Apparently the new Muni LRV‘s have the same problem, which makes me wonder if this is a stupid new fad among US transit planners. Signs posted in the new BART cars explain that the higher height is a design feature because it provides more space under seats to store luggage. I have yet to see anyone take advantage of this, as most riders prefer to keep their laptops and purses on them at all times. As a 5-foot-2-inch tall person, I had never really thought about seat height. BART’s 16.5 inches fit me just fine. (They’re among the lowest of its peers — consider 17 inches in Boston, 18 in Washington and 19 in Vancouver.) I tried out some examples of higher seats, and didn’t mind the dangly, feet-not-touching-the-ground feeling. It was pointed out that higher seats are more forgiving for taller people or those who have difficulty getting up and down. Chief Executive Carrie Lam Cheng Yuet-ngor gave the ringing endorsement at the HK$84.4 billion (US$11.3 billion) Guangzhou-Shenzhen-Hong Kong Express Rail Link opening ceremony, which was also officiated by Guangdong governor Ma Xingrui, before leading hundreds of guests to board the train. Ma described the commencement of the express rail link as a “milestone” in the establishment of the Greater Bay Area – Beijing’s initiative to link Hong Kong, Macau and nine Guangdong cities to form an innovation hub rivaling Silicon Valley. The measure, which provides for more than $606 billion in base defense spending and nearly $68 billion more in overseas contingency funds, is in line with White House requests and spending targets outlined in the annual defense authorization bill approved earlier this summer. The funding total — approved by a 93-7 vote — amounts to an increase of more than 3 percent for military spending in fiscal 2019. The appropriations fund 13 new Navy ships ― including three DDG-51 guided missile destroyers and two Virginia-class submarines ― 93 F-35 aircraft, 58 UH-60 Black Hawk helicopters, 66 AH-64 Apache helicopters, 13 V-22 aircraft, and $1.5 billion for the upgrade of 135 Abrams tanks. All Senate Democrats voted in favor of the bill. Voting against were 6 Republican Senators and Bernie Sanders. Saudi Arabia will soon start offering high-speed train services between Makkah and Madinah. According to the local reports, the first rail service will be on September 24, 2018. The 450km line will link the holy cities of Makkah and Madinah via Jeddah and the King Abdullah Economic City of Rabigh. The Haramain high-speed train line, which has been repeatedly delayed and resulting with cost increases, having originally been due to open in 2012. There will be eight services daily in each direction until the end of the year, according to the news on Saudi Gazette. Trains on the line will travel at speeds of 300kph, is expected to cut down the amount of time taken to travel between Mecca and Madinah to two hours. It will also shorten the travel time between Jeddah and Mecca to half an hour. The design and construction of the project will allow it to withstand tough climatic and heavy traffic conditions. Since temperatures in the region range from 0–50°C, the track will be designed to handle the temperature changes.